Future Scheduler is a great app that allows you to schedule activities like call, texts, emails to your contacts on future date and time. That’s not all because it also lets you schedule your social posts on sites like Facebook and twitter in future timings. Obviously Appsicum has come up with a great concept with this app as several time it happens to most of the people that they forget to wish their friends and family members on their birthdays, wedding anniversaries, etc because of the hectic and busy routine schedules. This App is specially worth for such people. Also, people who often forget to do important tasks in their daily life e.g. you want to call your wife after a business meeting to tell her that you will be coming home in late night hours but, once the meeting over, you forget to call your wife. In such case future scheduler can be really handy as you can schedule a call or a simple text to drop this message to your wife on future date and time. 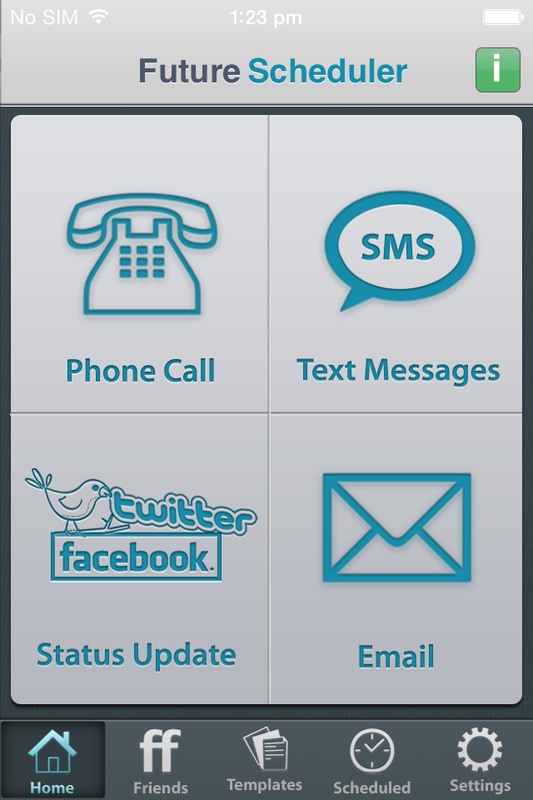 If you want to receive a confirmation alert before the app make a call, you can select confirmation radio button also. Versatility of this app is another features which can get your attention. This App is available for all platforms including iOs, Android and Blackberry. However, App charges you for the each sms/text you send to your contact as it’s not free and normal Text charges set by your telecom network can be applied. Most of the users feels confused a lot about the message credit system of future scheduler app.Here, I would like to tell that message credit balance is required for you to send sms through our server to any contact of yours as iOs does not allow any third party apps to send message through network services. Perhaps it will be more clear to you by the screenshot attached. Now the big question arises here why one should buy these text packages? Answer would be to avoid such circumstances where you become out of balance and still wants to schedule a urgent message to be delivered on future date and time.